> Time for a freebie! This is not a standard scrapbooking .png template. 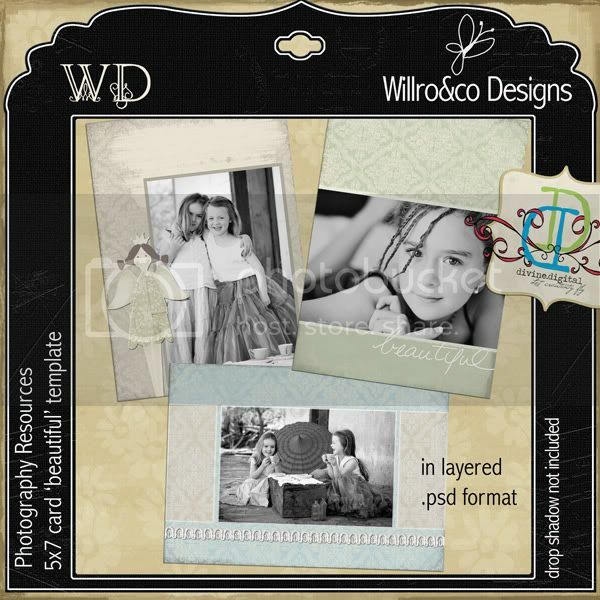 It contains a layered .psd file for a 5x7 card which can be altered to all the templates shown by adjusting the layers within the file. All papers and elements are provided as layers, with additional adjustment layers to modify the template to suit your photography customers. It includes the licence for photography studios to manipulate the template to taste and provide their clients with flattened files or prints. There are pdf instructions included to to show you how to modify the colours and textures of papers and elements. 3 variations on the card are shown, but there are many other variations possible. This product assumes a reasonable degree of knowledge in photoshop layers, adjustment layers and masks. This resources gives you the creative flexibility to make your paper work for your photo. Thanks so much for the card template. And also for sharing your own card layouts. Lovely! this is such a wonderful idea. Thanks! Thank you! Your blog post will be advertised on the DigiFree Digital Scrapbooking Freebie search engine today (look for timestamp: 31 May [LA 07:00pm, NY 09:00pm] - 01 Jun [UK 02:00am, OZ 12:00pm] ). Thanks very much for the freebie card - love it and can't wait to use it! Love your blog and your photography style! Totally love it Ro, thanks! what do you do on a rainy weekend?